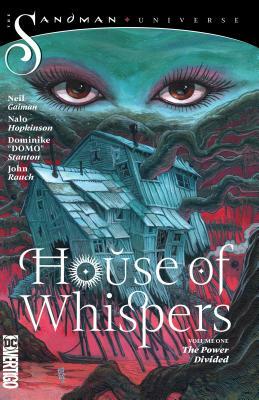 One of four books expanding Neil Gaiman's acclaimed Sandman Universe. Welcome to the House of Dahomey, the houseboat of Erzulie Fréda, where the souls of Voodoo followers go when they sleep but even the fearsome Erzulie is powerless when her dream river turns sour, tossing her house from one realm and into another.. the Dreaming! From her bayou, Erzulie scries upon the mortal realm and sees four human girls open a mysterious and magical journal filled with whispers and rumors that, if they spread, could cause a pandemic unlike any the Earth has seen, with the power to release Shakpana, the loa lord of infectious disease and nephew to Erzulie, who is currently banned from the human plane. Meanwhile, a mysterious infection doctors are calling "Cotard's Delusion" spreads, trapping countless souls in the Dreaming and leaving their physical bodies yearning for death. Written by Nalo Hopkinson, award-winning author of Brown Girl in the Ring and Midnight Robber, and Dominike "Domo" Stanton, artist of the acclaimed Moon Girl and Devil Dinosaur. The Sandman Universe is a new series of books curated by Neil Gaiman for DC Vertigo. Conjuring epic storytelling and immersing readers into the evolving world of the Dreaming, The Sandman Universe begins anew with four new ongoing series, existing in a shared universe, building upon Gaiman's New York Times best-selling series that lyrically weaved together stories of dreams and magic. Nalo Hopkinson is an award-winning novelist linked with the afrofuturism literary movement, including works like Brown Girl in the Ring, Midnight Robber and The New Moon's Arm. Hopkinson teaches fiction writing at the University of California, Riverside, where she is a member of a faculty research cluster on science-fiction. In 2018, she will be a guest of the international comics convention, San Diego Comic-Con.